I had a very nice surprise today. A bottle of Alazani wine arrived from Georgia! (It was brought personally as a gift.) The bottle is very pretty its made of clay not glass which shows it is a wine produced in the now rarer but still traditional Georgian style. It is said the Alazani is the birthplace of wine and one of the most noted monasteries in western Asia is the Nekresi Monastery which overlooks the Alazani valley from its northern flank, and was once a major wine producer. The bottle of Alazani wine with its nice decoration. Although Nekresi no longer produces wine Georgia itself continues to be a major wine producer because of its climate and mountains, and other monasteries do produce their own wines. Alaverdi Monastery is noted for its wines and is said to be one of the earliest and longest wine producing places in the Alazani Valley. 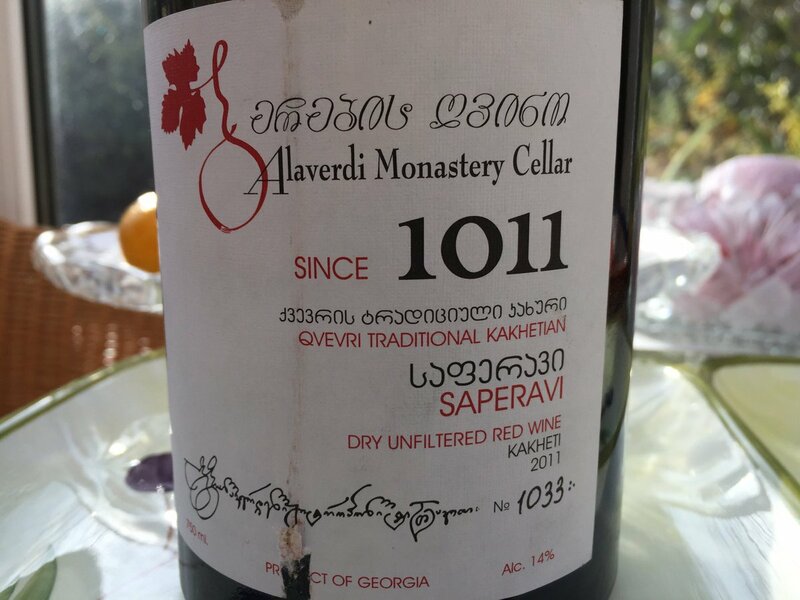 Father David Chrvitidze, who is responsible for the monastery’s wine, says ‘Wine-making is a sacred duty given to the Georgian people by God. That’s why we have 550 native species of grape. That’s why all our invaders tried to destroy our vines.’ Source: BBC. Detail inside the label on the Alazani wine I received from Georgia. The clay bottle showing the decoration in better detail. When I saw the Alazani valley name on the label I initially thought it referred to the valley in the Tusheti which I wrote about last year. Its not the same valley or river but it indeed flows from the Tusheti too only this time eastwards through Georgia towards Azerbaijan. The other I wrote about is the Gometsris Alazani river which flows northwards instead.